Need an energy booster to get you through that mid-afternoon slump? Same. This snack has a pretty self-explanatory recipe but I wanted to share it with you because it was so simple, yet super satisfying. I needed a pick-me-up before heading to the gym and my cabinets were bare. Making do with the few ingredients that I had, this yummy masterpiece was concocted! Full of protein, potassium, crunch, and creaminess, it’s #flawless! Don’t let your hand slip on the peanut butter serving (guilty as charged! ), as a serving size of 2 tbsp. will leave you with 15g of fat (3g being saturated). 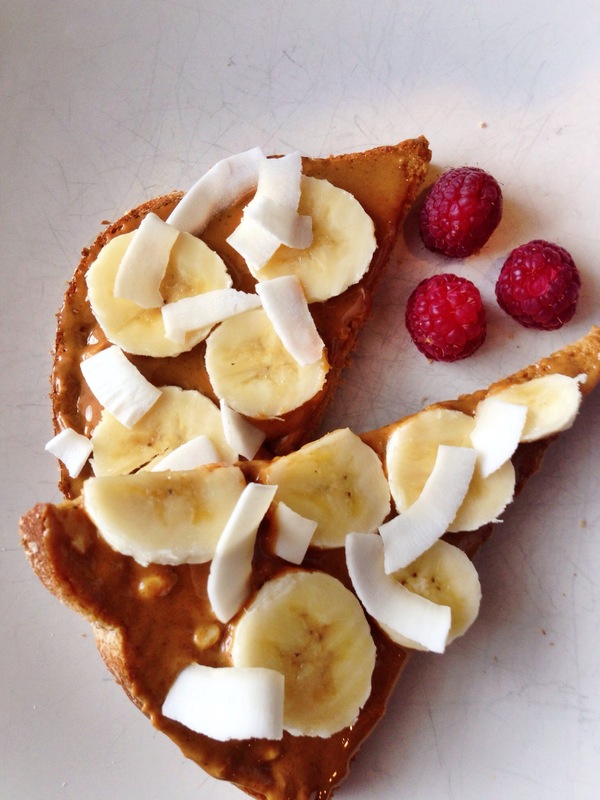 Slice some banana and top it with baked coconut flakes for some added crunch and sweetness. *(Many don’t know the difference so I’m here to tell you to go for whole grain rather than whole wheat products because it’s unrefined and contains the entire kernel, maintaining its nutritional value).